1 inch LCD display, 35 degree left / right swivel (350 degree with height rod fully retracted). Functions: LB / KG conversion, LB /KG lock out, body mass iIndex (BMI), zero out / tare, hold / release, auto zero, auto offDigital height rod: 24 to 88 inch. Two wheels for ease of movement. To be used with the Welch Allyn Connex ® Vital Signs Monitors. 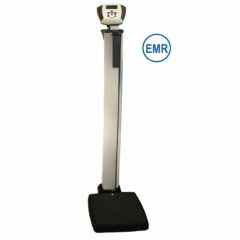 AllegroMedical.com presents The Elevate EMRscale Digitial Eye Level Scale. Resolution: 0. 2 lb. / 0. 1 kg. EMR connectivity via USB. 1 inch LCD display, 35 degree left / right swivel (350 degree with height rod fully retracted). Functions: LB / KG conversion, LB /KG lock out, body mass iIndex (BMI), zero out / tare, hold / release, auto zero, auto offDigital height rod: 24 to 88 inch. Two wheels for ease of movement. 2 year limited warranty. To be used with the Welch Allyn Connex ® Vital Signs Monitors.